Der Stamm Stachelhäuter gehört zum Unterreich Vielzellige Tiere, Eumetazoa. 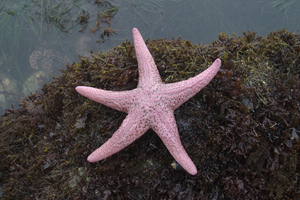 "Giant Pink Star (Pisaster brevispinus)" by Jkirkhart35 via Flickr, Creative Commons Attribution. 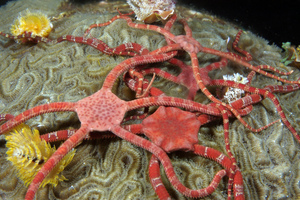 "Sanc0448" by NOAA Photo Library via Flickr, Creative Commons Attribution. 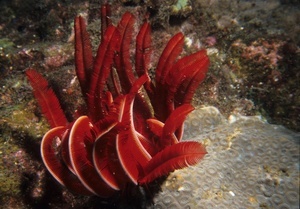 "Red feather star" by Derekkeats via Flickr, Creative Commons Attribution ShareAlike. 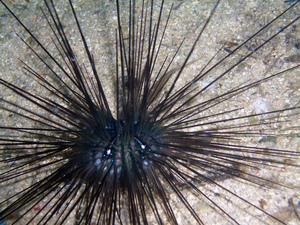 "Sea Urchin (Diadematidae) (20 cm)" by CybersamX via Flickr, Creative Commons Attribution. 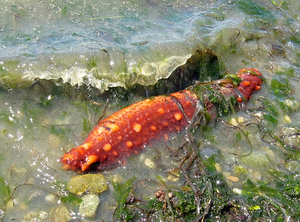 "Another of that sea cucumber" by Pfly via Flickr, Creative Commons Attribution ShareAlike.